On Sunday evening Matt, Emmet and I went to Kansas to get a few pairs we need to have at our house. We need to have them at our house because we need to get the calf portion of those pairs ready for the Iowa State Fair – yep, giving ourselves that whole three weeks of prep time. No problem! !…I hope… So – you might have noticed we were a kid short when we headed to the pasture. Kaydee was CRABBBBBYYYY. Her dad told her it would be just fine if she wanted to stay home and pack for her FFA officer retreat and do a few things around the house. Sometimes a girl just needs a few hours to herself & we were glad to help accommodate her need of alone time. It made the rest of our day MUCH more pleasant. Yep – it was a swimming party; complete with a shaded beach, snacks all around, and plenty of cool, refreshing (ignore the muddiness) water. Let me tell you, when you want the cows to go to the far south end of the pasture and they are in their height of luxury in the far north end of the pasture….you have your work cut out for you! We did get everyone we needed headed south (after throwing some dirt clods into the pond to get the cows moving, and come coaxing with range cubes) toward Matt with the pickup and trailer and the portable panel catch pen. However when we were just close enough to start getting them inside the pen, the clouds got alot darker, the wind picked up, and the temperature dropped at least 15 degrees. Great! We were on a dirt road. We were thrilled for the MUCH cooler temp, but we did NOT want to be stuck a long way from anywhere. So, off we go, back to the farmhouse to wait out the storm….that never came. It completely went around us – which was ok. We decided to go check another pasture while we waited to make sure it wasn’t going to rain. 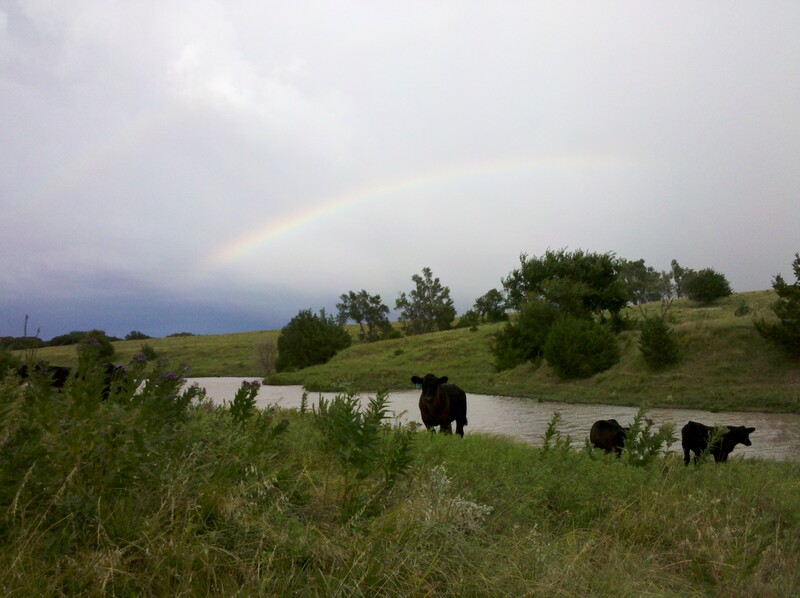 Here is what we got to see while we were out there – a beautiful rainbow. It was even double for a little while. On our second attempt at getting those fore-mentioned pairs in, we were successful. The pairs are now here at the house and Emmet assures me, those calves will be show ready by mid August. I’m taking his word for it…and helping him out when he asks. I enjoy that kind of work way too much to let he and Kaydee have all the fun. 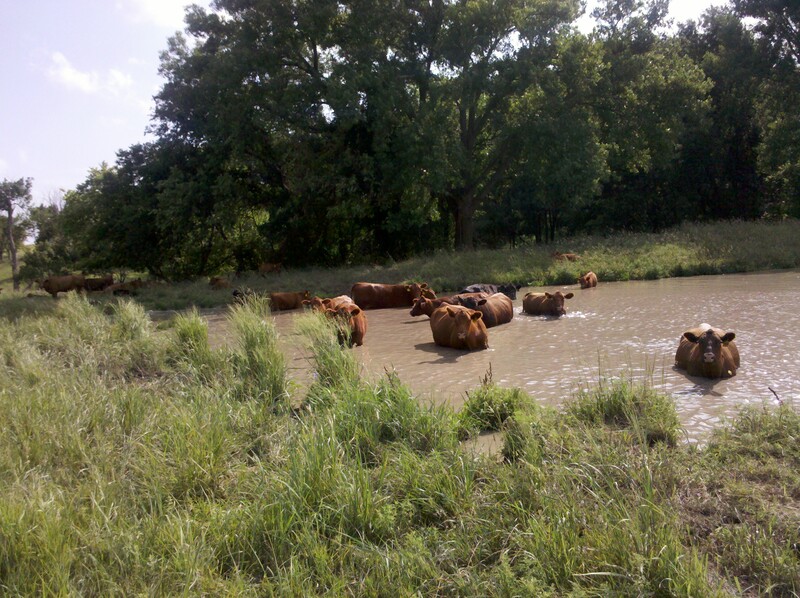 We should all take a lesson from the cows in the pond – do what is most comfortable & enjoy life! Recently, I’ve heard that 4-H could desensitize our kids; that we are harming them in some way by allowing them to participate in livestock projects & county fair premium auctions. I could not disagree more & I would like to address each of the H’s with observations from this year’s fair. Head: I saw kids all over the fairgrounds using their heads in any number of creative ways. It was really hot during our fair & 4-H’ers found all kinds of ways to try to stay cool – from water fights to fans to cold lemonade-they were thingking! I also saw 4-H’ers who know exactly how to feed their animals (and most 4-H beef rations are not totally simple), clip and groom the animals, and explain their projects to fair-goers walking through the barn. There were kids who know exactly how to show their horses, sheep, goats, and pigs. Of course, many kids are bright enough to talk their parents into giving them a few dollars to spend as they wish, too. 4-H members are very bright young people! Heart: This is probably my favorite “H”. I saw kids helping each other in all kinds of ways from chores to fitting and clipping. I watched young people serve customers at the 4-H food stand with the utmost politeness and respect. I also saw many kids who were completely dedicated to the care and presentation of their animals and knew that their animal was a food animal – even though they loved it, they were willing to let it go for it’s intended purpose. During the auction there are almost as many parents with lumps in their throats and a tear in their eye as there are sad kids. Even more importantly – I saw displays of great sportsmanship. There is only one winner in each class. Nothing makes me more proud than when those who got anything other than first congratulate and shake the hand of the champion. 4-H kids are top-notch! 4-H is the heart of the fair – if it weren’t for the kids’ projects and livestock shows, it just wouldn’t feel like a fair! Hands: Many hands make lighter work for all. 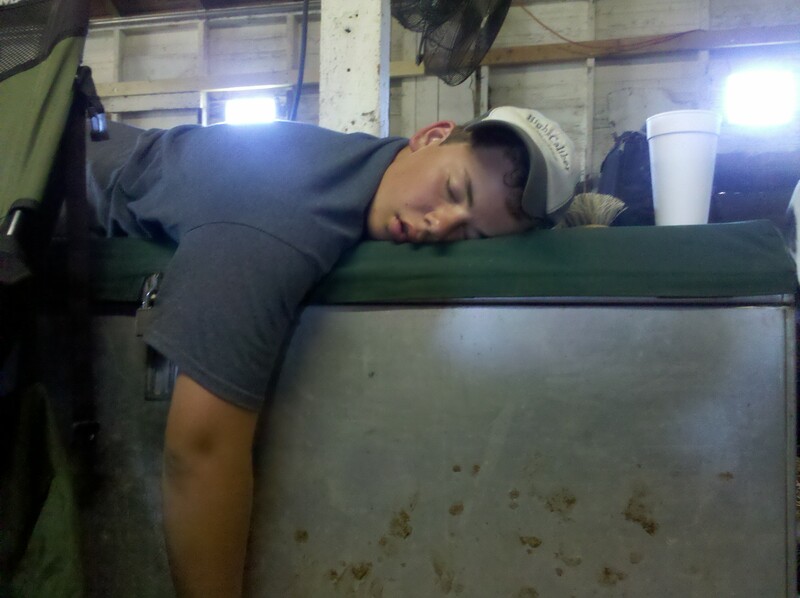 Showing livestock at a county fair is hard work. Everyone has more responsibilities than just taking care of their own animals in order to make the whole event happen; there are grandstand shows to put on, trash to be hauled, bathrooms to clean, and the list goes on. “Hands for larger service..” can be seen in every corner of the fairgrounds. People were serving food, putting up displays, cleaning pens and stalls, judging projects, and attaching ribbons to exhibits. And everyone has a great time working together! Health: We all know that fair food is the best…for a few days! Our fair is doesn’t have all of the traditional items – in fact, nothing on a stick. So – it really is healthy, darn it! But, we do have homemade pie donated by the 4-H families served at the 4-H foodstand every day! Other than lack of sleep, fair can be really healthy. I’m pretty sure that I sweated off at least 5 pounds last week…now to keep it off! Now that our fair is over, we will take in several area fairs evening events & look at other counties’ 4-H project exhibits & just enjoy being there without all of the work to do. I wish everyone could know the enjoyment of a county fair like 4-H livestock exhibitors know the fair. The best memories, friendships, and learning lessons can come from one quick week each summer growing up.